This is an Optional Front or Rear Skid Wear Plate for the T/E-Maxx. 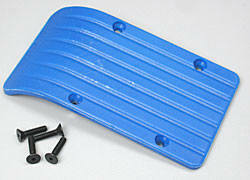 This part attaches onto the stock plastic front or rear skid plate. REQUIRES: Assembly onto the T-Maxx or E-Maxx trucks. COMMENTS: This is a wear plate designed to fit onto the original skid plates.